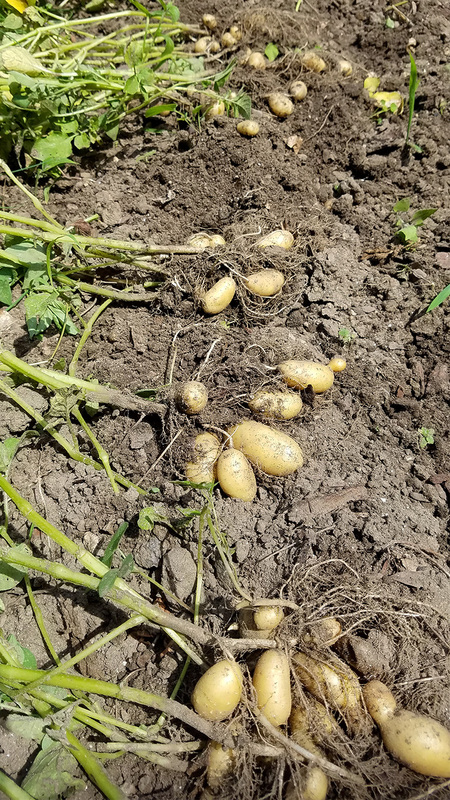 Stupidly, I did not note when exactly I planted these potatoes, known as les rattes. Fingerlings. But it was late April. From potatoes that had sprouted. By early May the first leaves had poked up above the ground and I started mounding earth up against their stems. 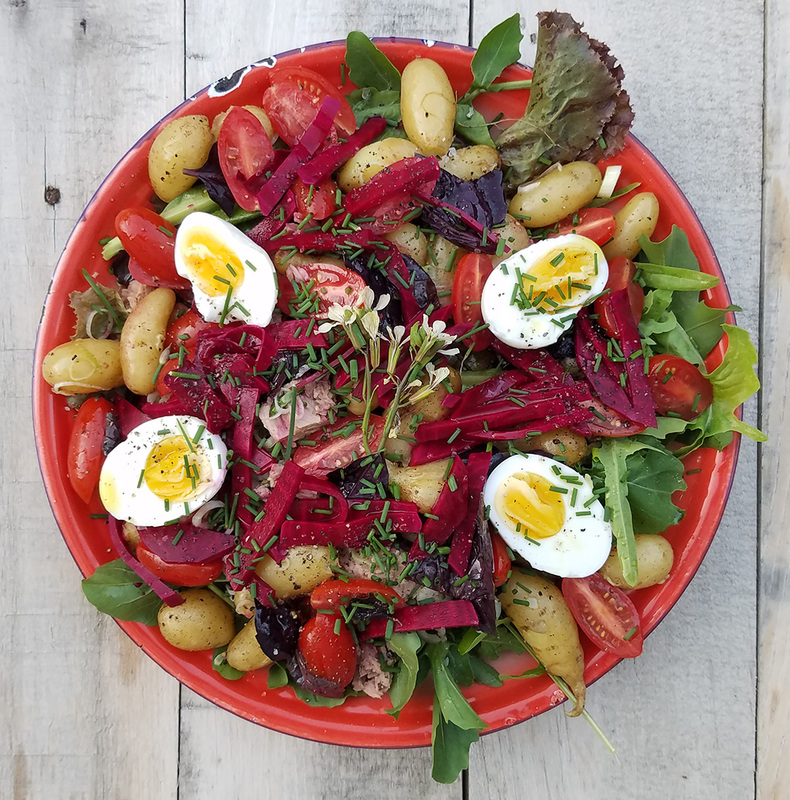 I dug them up on the 4th of July (so about 8 weeks after planting) and we ate the first ones that night in a Niçoise salad, with quick-pickled beets, and arugula and lettuce leaves, purple basil and chives from the garden, plus the obligatory eggs. They have a firm, waxy texture and very good, slightly nutty flavour. The second portion was eaten as a potato salad with mayonnaise and crisp celery heart (try and find organic celery - it is one of the most sprayed crops out there, as it is is a bug magnet), and I'll pan-roast the last batch. If I can stand to turn on anything that generates heat. It is very hot and very muggy. Nice looking salad. 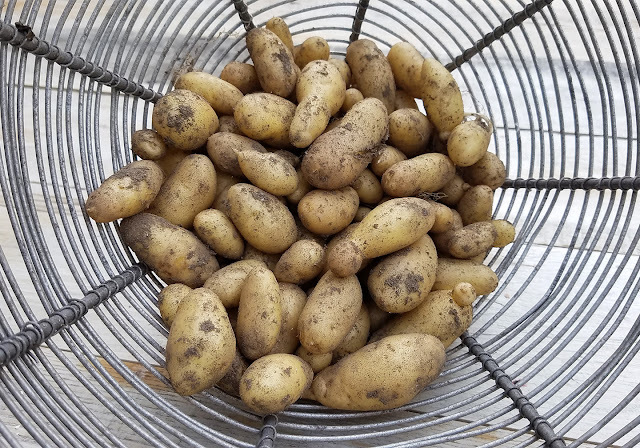 I love fingerling potatoes but have not grown my own...yet. Have you ever tried taking the end piece off a store bought celery and rooting it then planting it in the garden? I do that all the time and then you can just pluck off little leaves to add to salads etc. It grows well in my earthboxes. I actually do have a row of celery, but like you, I just use the leaves. I grew these ones from seed (have not tried rooting the base). That salad is a work of art! Beautiful and delicious, I'm sure. You could grill the potatoes. Cut 1/2" thick, parcook in salted water for 5 min. Drain and put on baking sheet to cool. Then brush with olive oil and S & P and grill for 5-7 min. No heating up of oven needed. Can't say they're better than roasted new potatoes, though. ps What is the little herby looking thing in the middle of the salad? Or is that a flower? The herby thing is a flower - arugula.